The big question on the lips of most people looking for a home renovation is: where do I start? Approaching such a large task with no basis of knowledge for how to do it right can certainly be a daunting task. And while we like to think we’re pretty helpful in one small area of home renovations, there’s a whole lot more to it than just that. 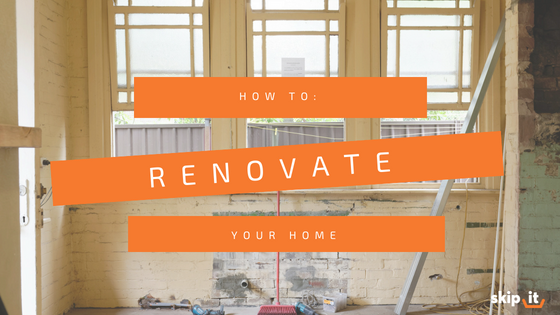 So, to help you get moving in the right direction, we’ve pulled together some advice covering different areas of the renovation process that should give you an idea about where to start with your own home renovation. The first thing that any sensible person looking to renovate their home needs to do is establish how much money they’ve got to work with before deciding how they can get the most from their budget. Renovation certainly isn’t cheap, but there are clever ways to stretch your money if you know exactly how much you have to spend and what you want to achieve. Have a look around your house and make a list of priorities. Are you looking for a complete overhaul or just a one-room redesign? What rooms are most in need of a redo and which can wait? Everyone would love to be able to have a dream redesign of absolutely everything – but working out what’s actually feasible is an important first step in making those dreams a reality. Of course, not all renovations are the same. Simply installing furniture or new flooring in your lounge is very different from say, building an extension. It’s important to establish early on whether your project will involve changes to the exterior of the building or will just involve rearranging what you have inside. If you decide to include exterior renovations, you’ll obviously have to significantly increase your budget. It’s also important that you save a certain amount of funds as a ‘safety net’ when planning exterior works. You never know what could go wrong, or what structural faults you might find in your house while the works are taking place. This is the fun part. Who hasn’t wanted to completely redesign their own lounge or bathroom? If you’re quite savvy in the interior design department, you might want to try and design this for yourself. If not, you can get in touch with some interior decorators who will specialise in taking your raw creative ambitions and transforming them into a tangible and realistic design. Once you’ve worked out what you’re going to actually create, you need to find the best people to bring that to life. If you’ve worked with an interior designer in creating your new living space, there’s a good chance they’ve got some contacts they can recommend that’ll do a good job. If not, you’re going to have to do some shopping around to find local, reasonably priced and skilled traders who are available when you want them to be. Navigating the compromise between price and quality is always going to be tricky. You don’t want to skimp on costs and end up having to redo everything in a few years’ time. You also don’t want to spend a lot of money on services you can quite easily get for a better price elsewhere. The trick is to give whoever you’re talking to plenty of information and compare a wide range of quotes. Also, check out what previous clients say on online reviews to see if everything stacks up. Different contractors will give you a quote based on their particular specialities– it’s important to identify whether what they’re selling is the best possible use for your money. Once you’ve worked out what exactly is going to be renovated and how you’re going to go about doing it, you’ll need to make sure you get rid of everything that’s already in the room or house. This might seem like one of the easier parts of the whole process, but don’t look on it too lightly. If you’ve got bulky waste collection items like furniture that you need to remove, it can often be a lot more difficult than simply, ‘getting rid of it’. If you get in touch with us, you can order house collection or rip out services that are designed to responsibly dispose of inconvenient and bulky items, with minimal effort or stress. Over 90 per cent of the waste we process gets diverted from landfill, and we provide a guaranteed two-hour slot during which we’ll arrive and process your waste in as quick and efficient a way as possible. Make an enquiry here if you want to find out more about our services or book yours today.